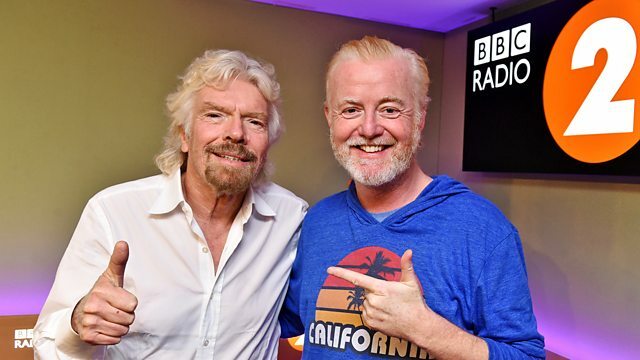 Sir Richard Branson has revealed that he had a conversation with Chris Evans about joining Virgin Radio nearly a year ago while making an appearance on his Radio 2 breakfast show. Speaking on ITV’s Good Morning Britain earlier this week, the Virgin founder admitted it was “maybe a slight discourtesy to the Beeb to steal one of their people”, but says he suggested that a change of scenery “would be good for him” while in the Radio 2 studios for an interview in October 2017. Sir Richard was on the Radio 2 breakfast show on Thursday 12th October 2017 to talk about his autobiography,’Finding My Virginity’. Chris announced on Monday that he was leaving Radio 2’s breakfast show after 8 years, and within a couple of hours it had been announced that he was joining Wireless DAB station Virgin Radio UK in the New Year. He’ll replace Sam and Amy, who only took over the breakfast show on 2nd October last year. On behalf of all Radio 2 listeners thank you Richard. WILL YIU FOLLOW CHRIS EVANS TI VUIRGIN RADO?